The diverse variety of businesses that make up the Heart of the Shires retail shopping centre offer fantastic opportunities to be creative. Here are a selection of graphics produced, within the past month, to promote the outlet. From the selection of graphic elements here, clearly cute canines are the way forward as they won the popularity contest with 4.5k organic reactions on Facebook for Paws at the Shires, House of Carillon was second with 4.3k reactions and Simply Salvaged 4.2k. The Heart of the Shires is a Northamptonshire shopping village is a unique retail outlet near Daventry in Northamptonshire that offers shopping without the stress. Set around a Victorian courtyard, The Heart of the Shires Shopping Village offers a selection of individual shops with character. From kitchenware to bridal couture, antiques and collectibles, clothing, tasty treats, gifts, watches, home furnishing and gardenware. 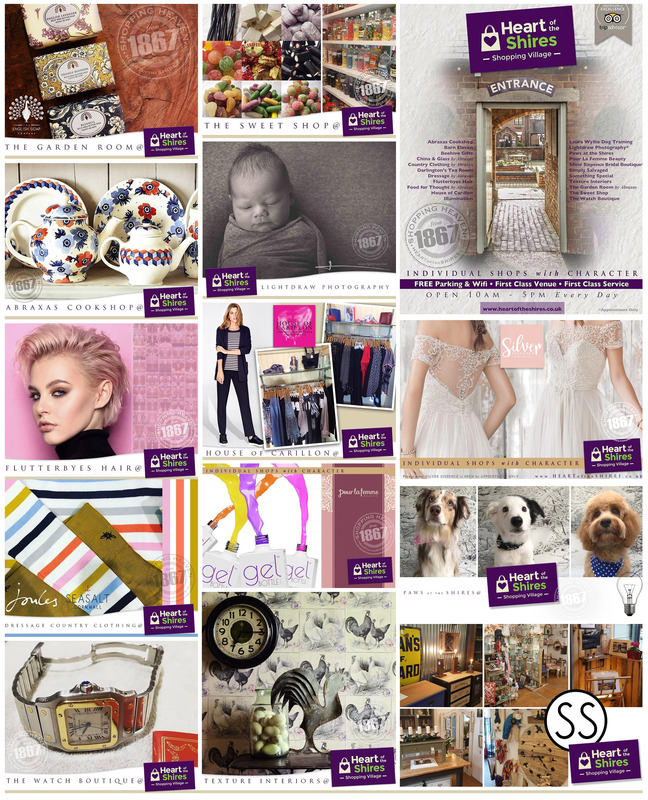 Complete with a photographic studio too there really is something for everyone at Heart of the Shires with elegant gift solutions as well as Darlington’s, the popular licensed restaurant and tea room. There’s also plenty to pamper yourself including a beauty salon and hairdressers – and you can now pamper your pets too!